We specialise in creating websites for wildlife, community and eco-friendly organisations and companies. Our clients include local and national wildlife groups, ecological surveyors, eco visitor centers, community woodland groups and more. Our Basic Website Package (£599) includes a unique design, user-friendly administration system, unlimited email addresses, wind powered hosting, personal help and support and an online support knowledge-base. We also offer a number of Optional Extras for your website including an events calendar, publications download system, online membership system and more. We also develop custom systems based on your own ideas of what you want your website to do. We offer a graphic design service including logo design and branding, leaflets, posters, folders, icons and more. 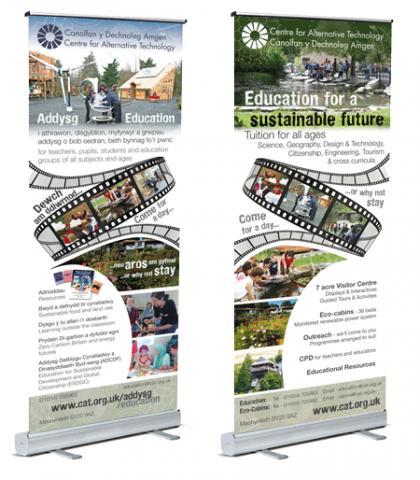 Our prices are aimed at community groups, charities and not for profit organisations, please contact us for a quote. We're now offering a new short run eco printing service to our customers! If you need printed matter such as leaflets, business cards, posters or anything else to promote your company or organisation, we can design it and print it for you on 100% post consumer waste paper with soy ink with our environmentally friendly Ricoh Gel ink printer.